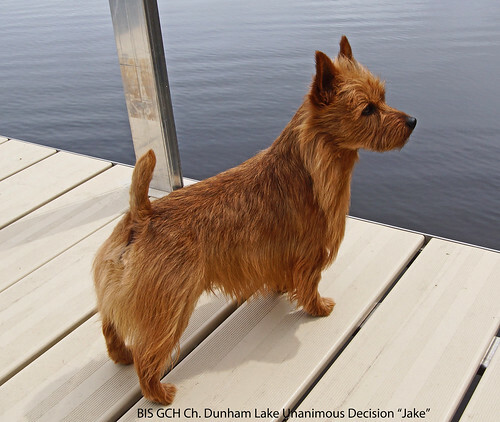 BIS BIS/NOH GCH Dunham Lake Unanimous Decision "Jake"
MBIS-RBIS-MBISS-MBIS/NOHS SILVER GCH CH DUNHAM LAKE UNANIMOUS DECISION "JAKE"
What an honor to win Best in Show today among so many beautiful dogs. 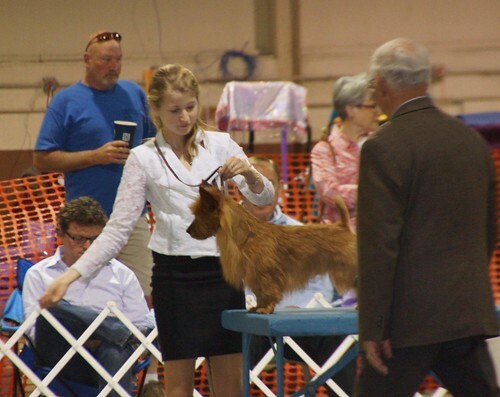 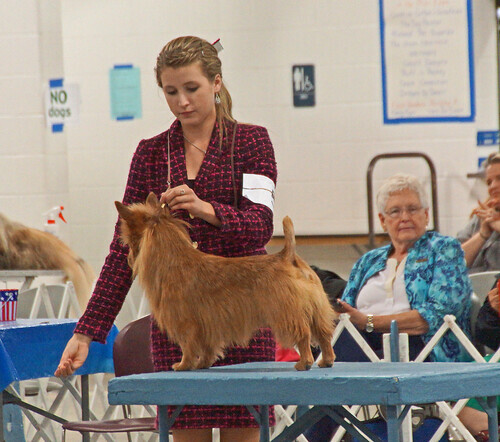 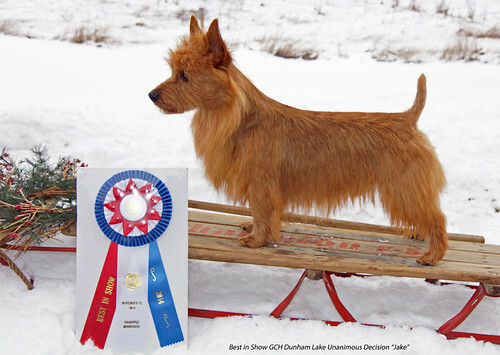 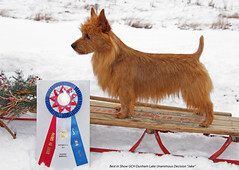 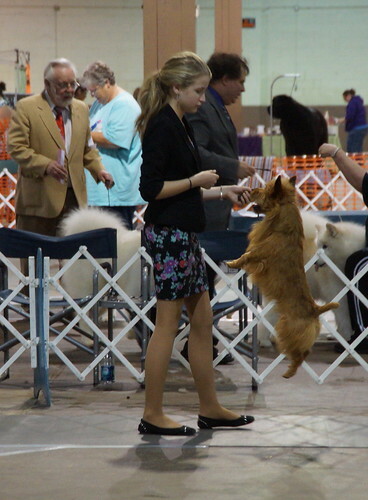 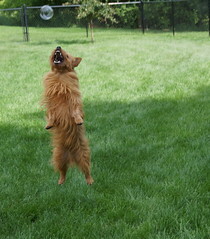 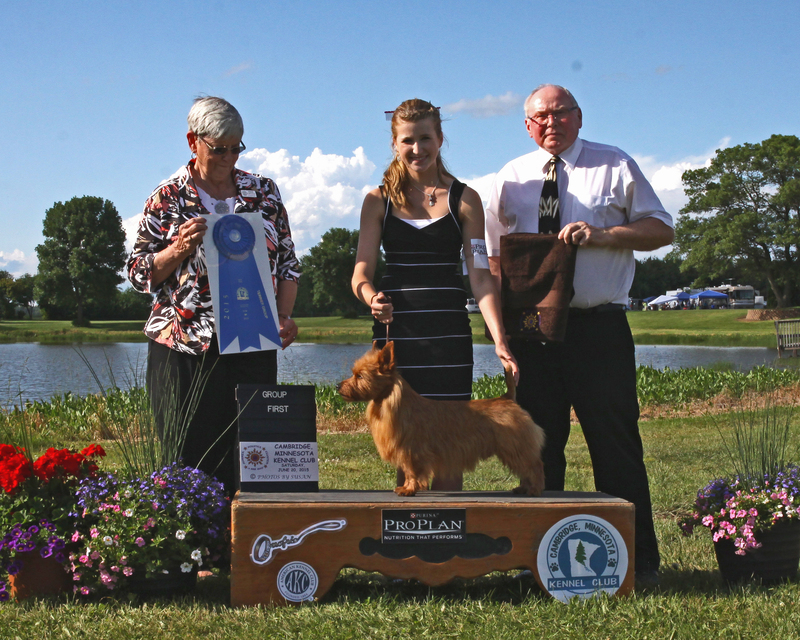 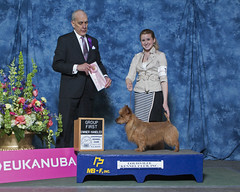 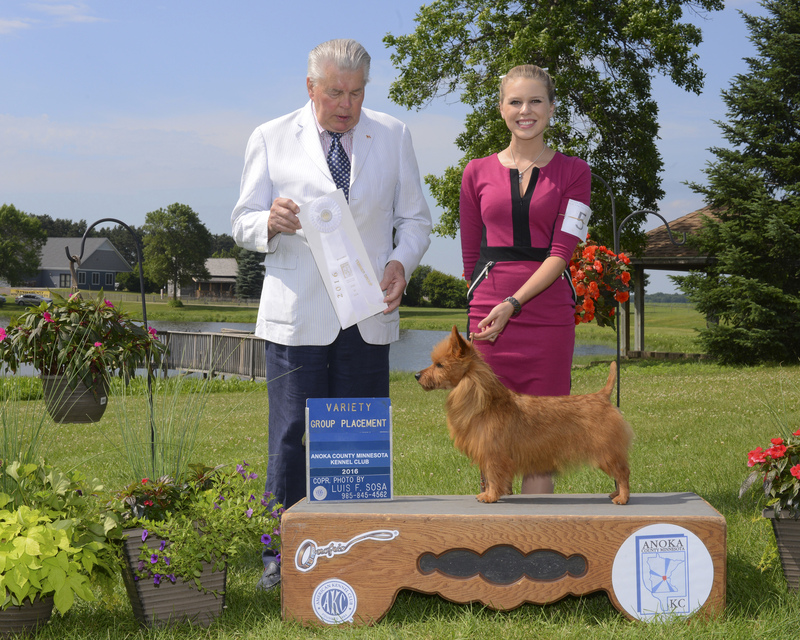 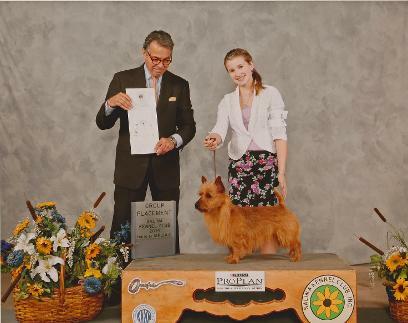 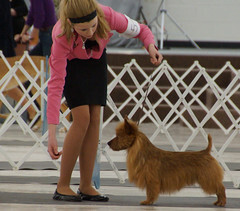 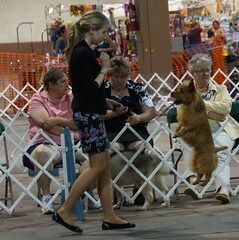 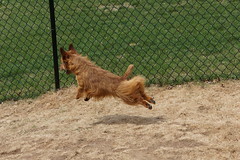 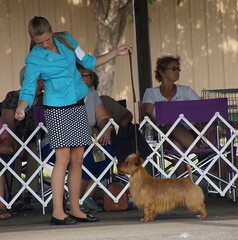 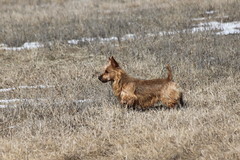 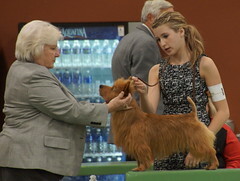 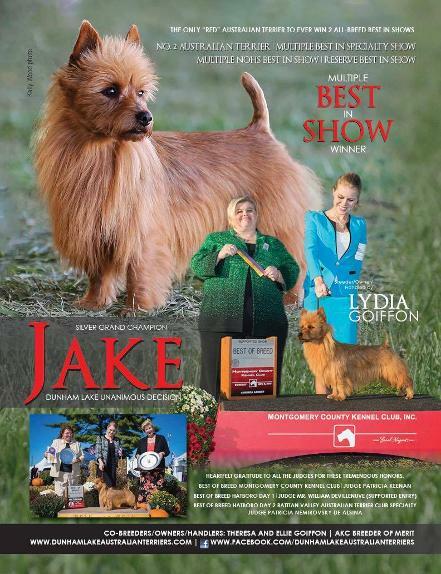 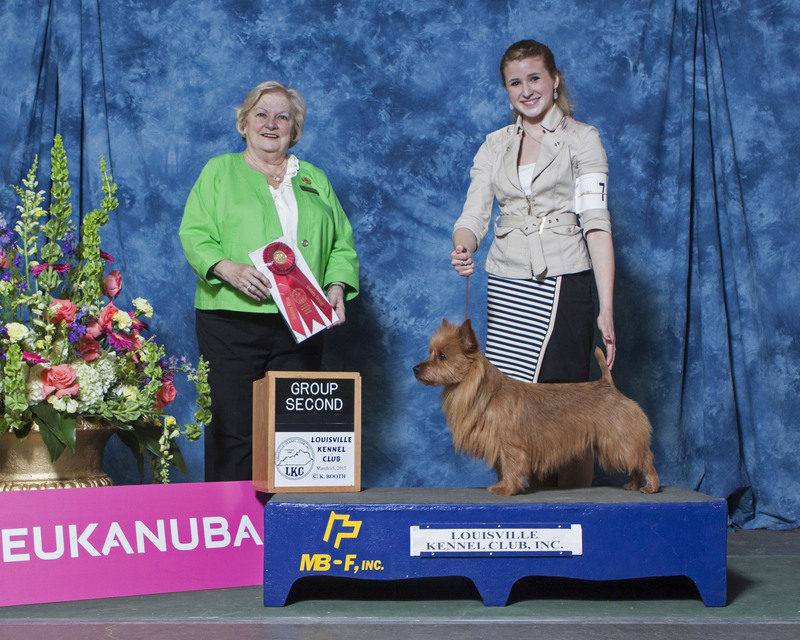 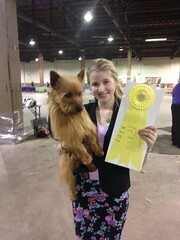 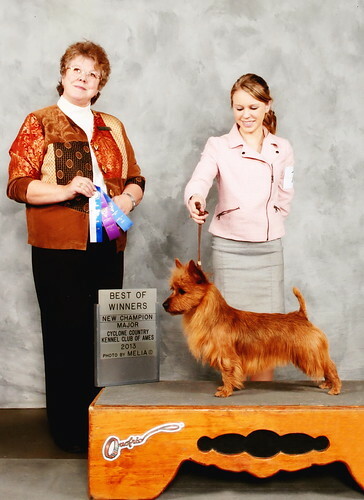 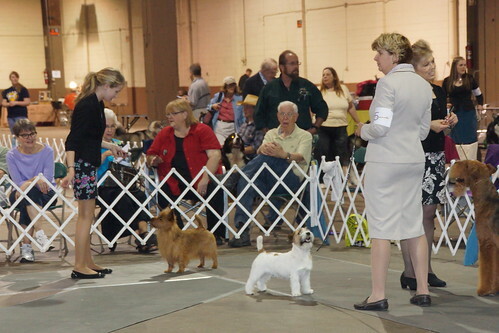 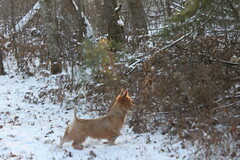 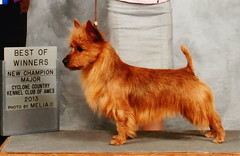 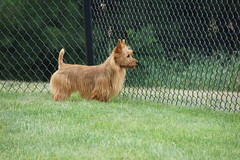 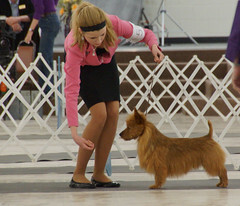 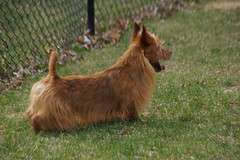 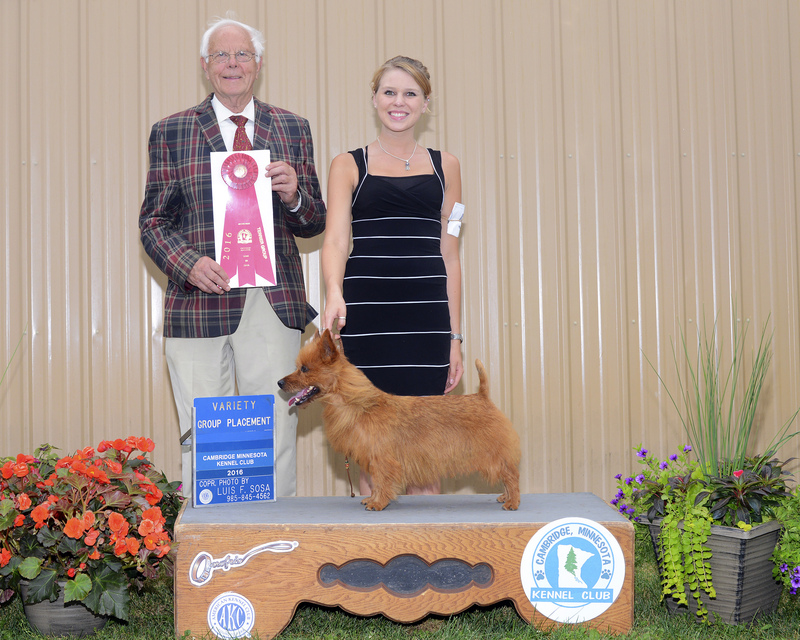 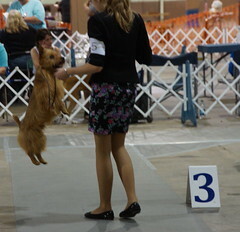 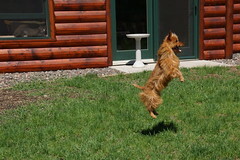 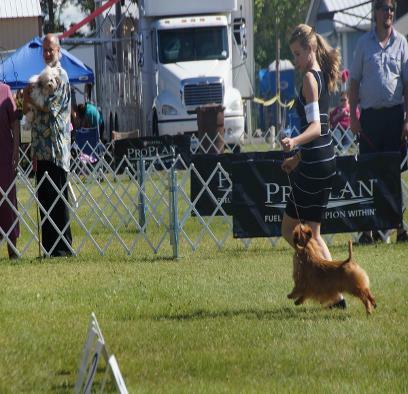 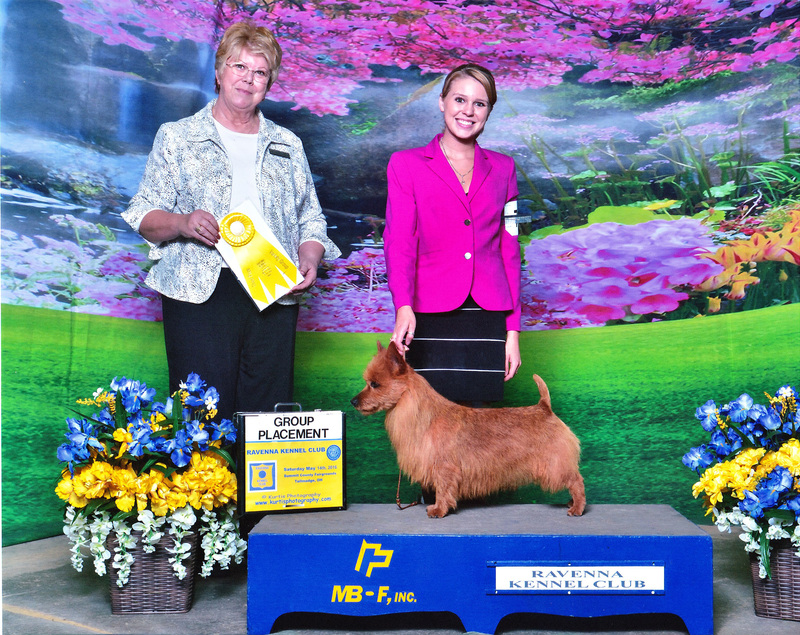 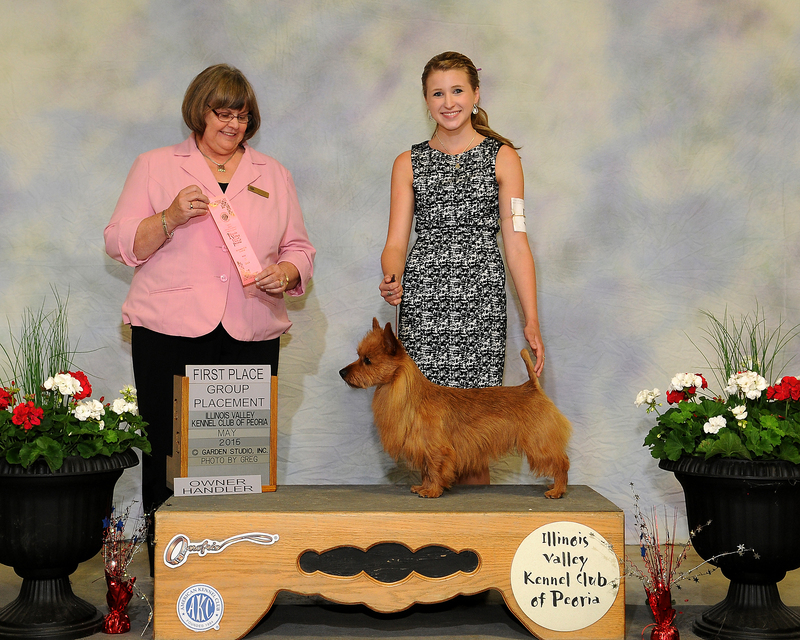 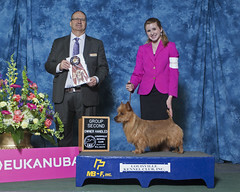 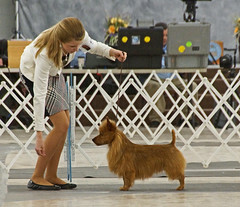 Today Jake made history as the only red Australian Terrier to ever win a Multi Best in Show in the USA. 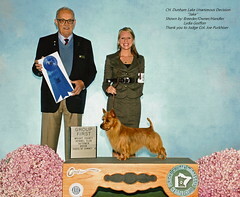 Bred/shown owned and handled by Lydia Goiffon. 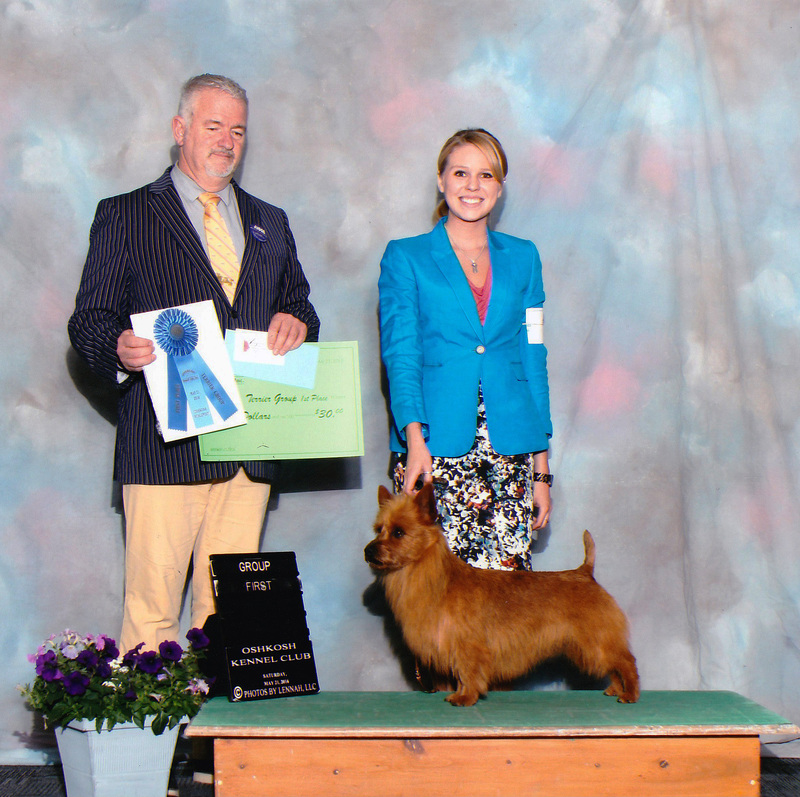 A huge thank you to the Terrier Group Judge Gloria Geringer (one of our favorite judges) and Best in Show Judge Guy Jeavons (a Canadian Judge who we really enjoyed showing to) we can't begin to thank him enough. 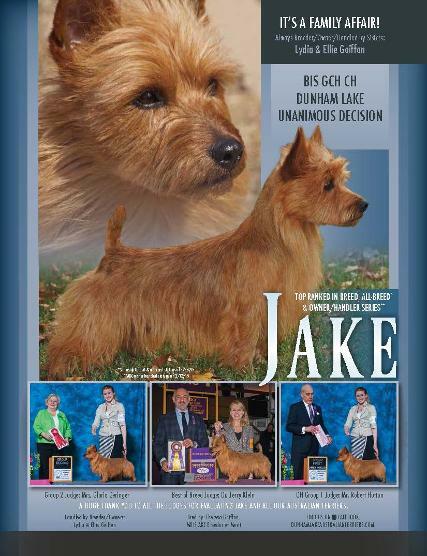 2015 Best of Breed for BIS BISS GCH Ch Dunham Lake Unanimous Decision "Jake" at Hatboro day 2 under Judge Mrs. Pamela Peat. 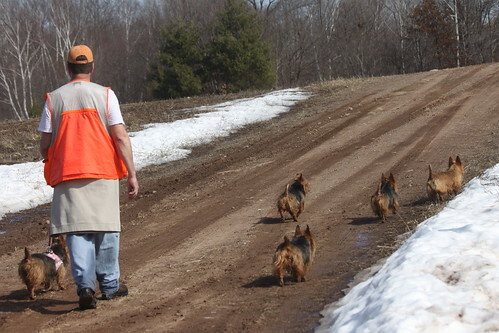 This was a designated Specialty day. 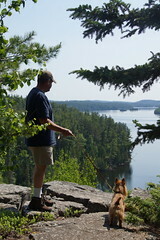 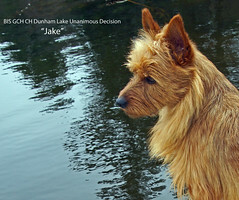 Jake also won a Group 4 in the Owner/Handler Series as well. 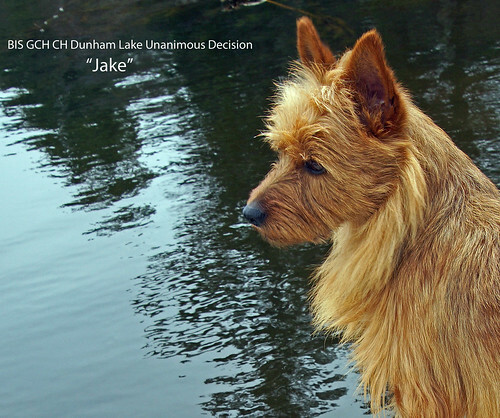 Jake's Granddaughter in the Netherlands. 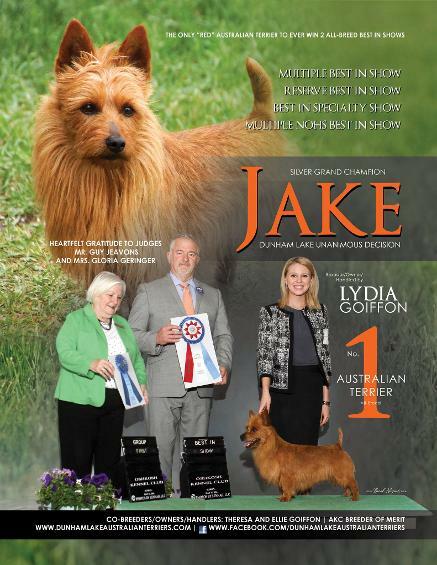 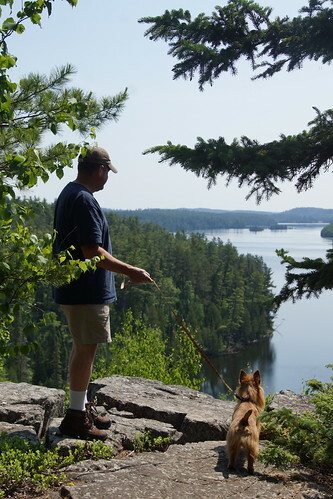 A huge thank you to Judge Mr. Wood Wornall for this huge Group 3 win at the St. Croix Kennel Club, August 2015 and all the amazing compliments he shared with us about Jake! 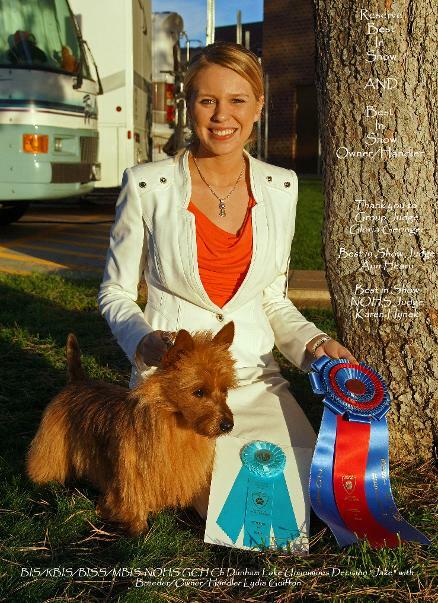 Thank you to the honorable Judge Dr. Jerry Klein for this huge award. 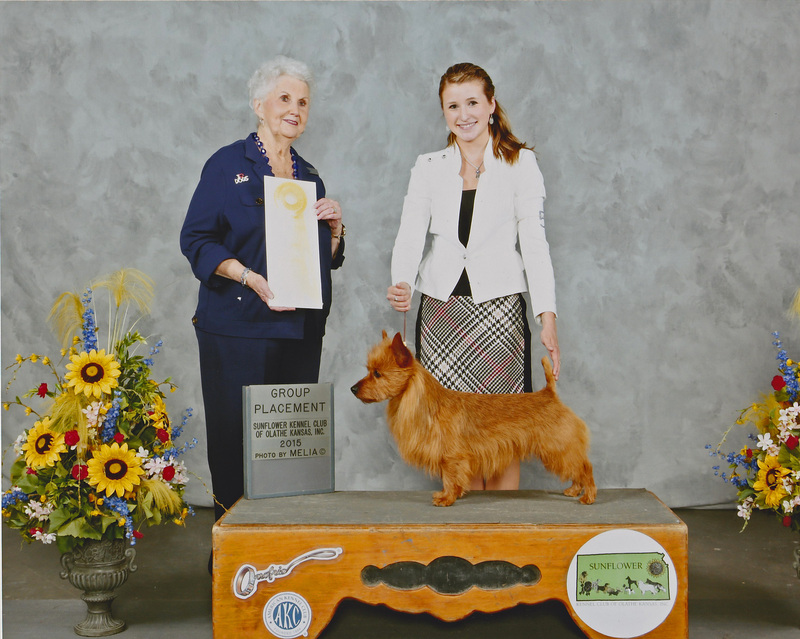 Thank you to Group Judge Betsy Dale and Best of Breed Judge Gloria Geringer for this huge honor. A HUGE Group 2 at the Kentucky Cluster, just behind the #1 Skye. 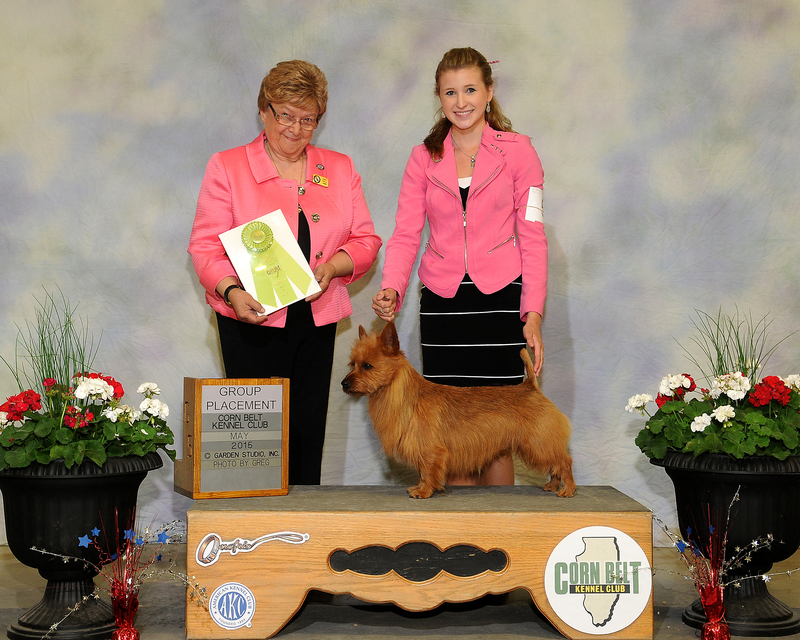 Thank you to all the judges for these great honors! 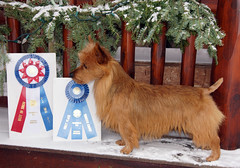 Photo left: Jake awarded the 1st Best in Show (NOHS) under Judge Mrs. Beverly Capstick. 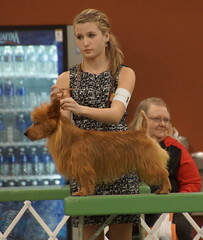 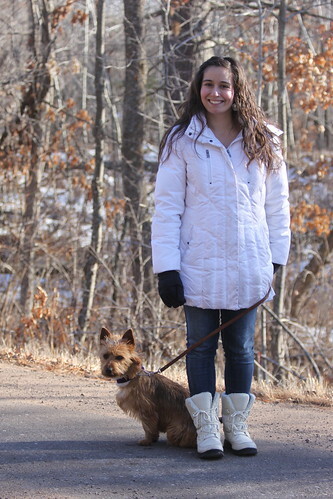 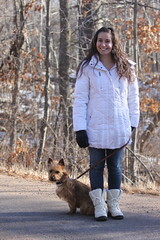 Shown by breeder/owner/handler Ellie Goiffon. 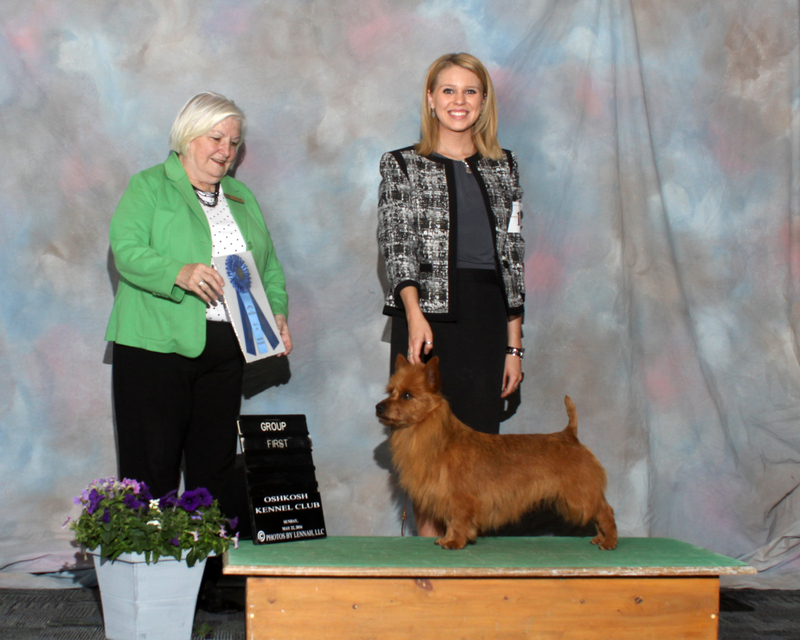 Best of Breed at 2015 Westminster! 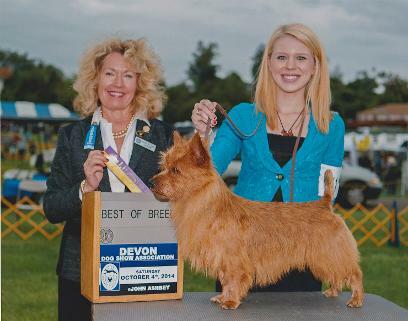 Best of Breed at Devon 2014 under Judge Connie Clark. 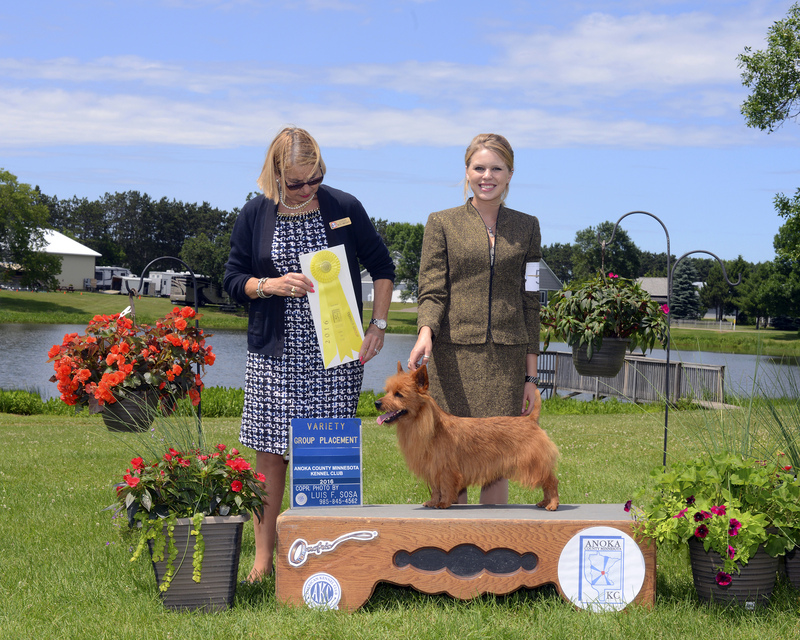 Thank you to these judges for these awards and recognizing our breeding in this way. 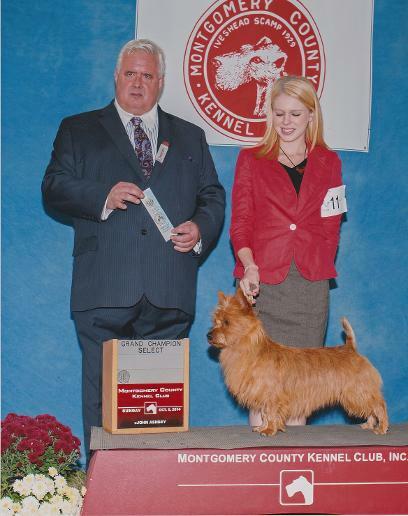 Select win at Montgomery under Judge Mr. David Kirkland. 2014 World Show in Helsinki Finland! 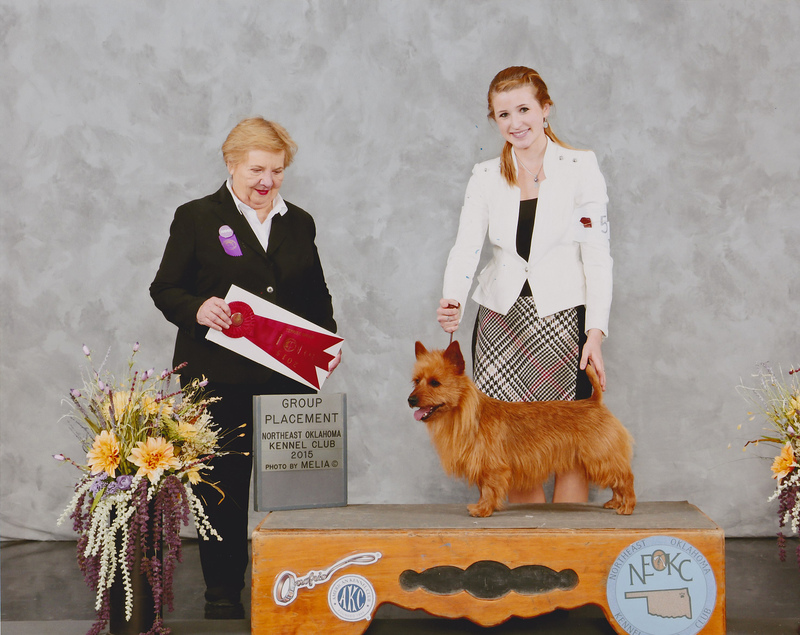 Best of Breed 4 days in Kansas 2014 and a Group 4 under Judge Elliot Weiss. 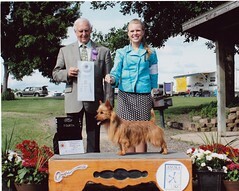 Thank you Mr. Weiss for this honor. 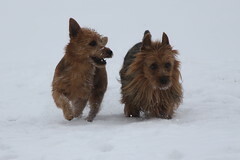 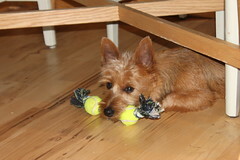 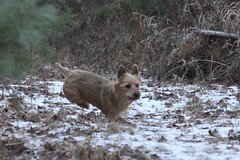 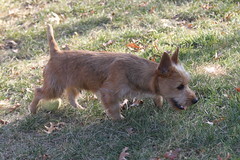 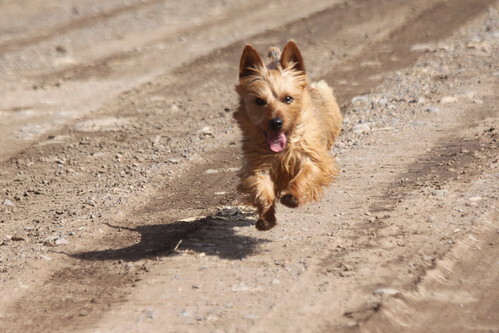 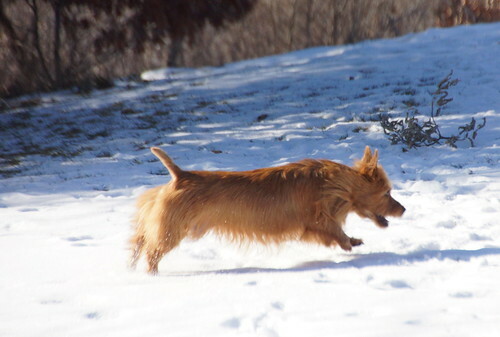 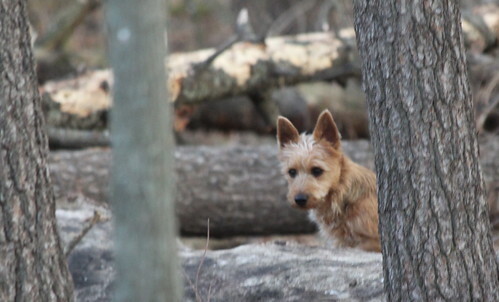 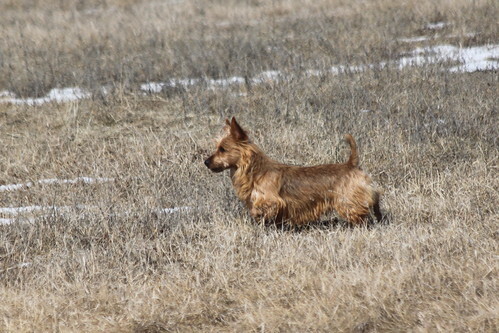 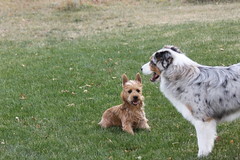 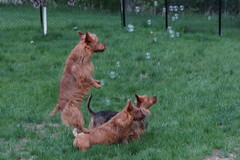 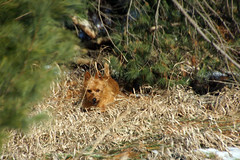 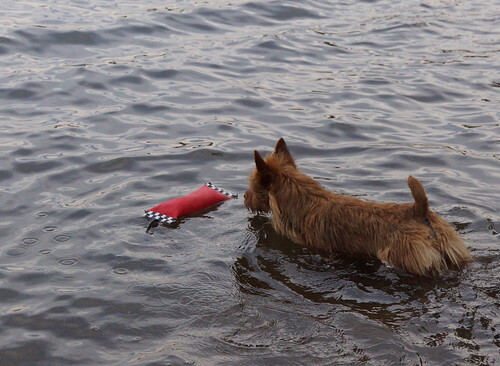 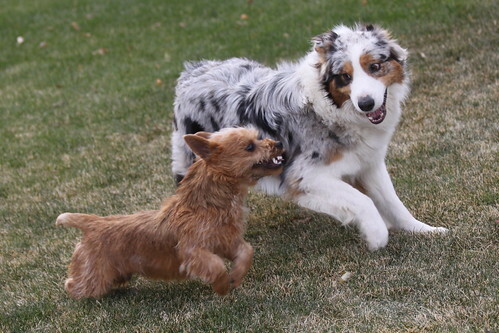 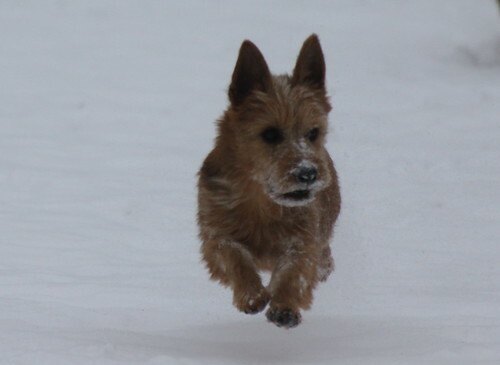 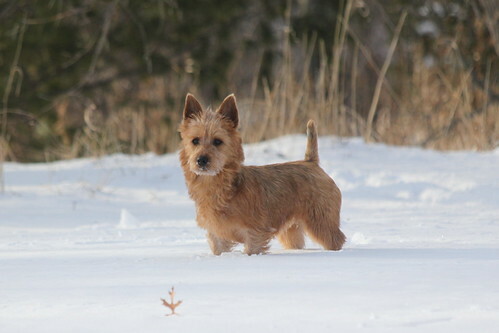 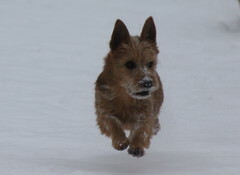 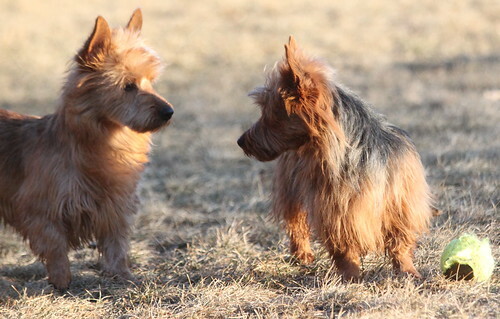 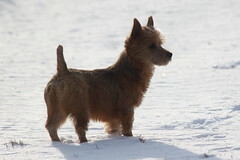 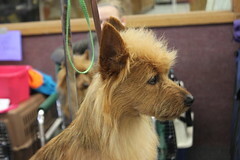 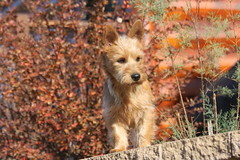 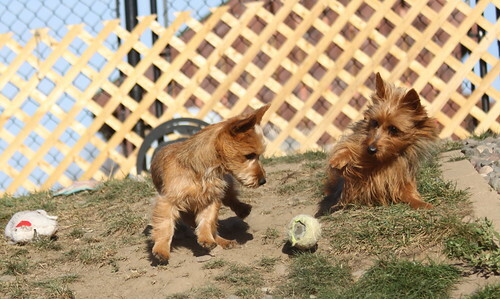 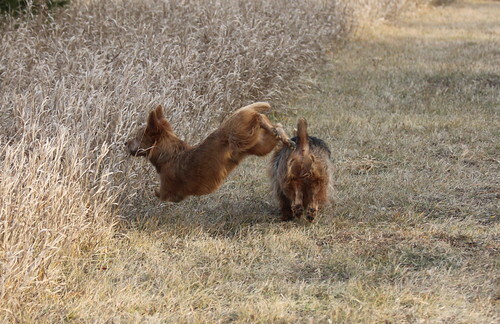 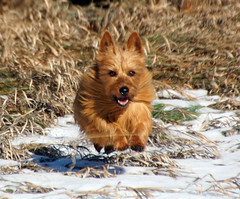 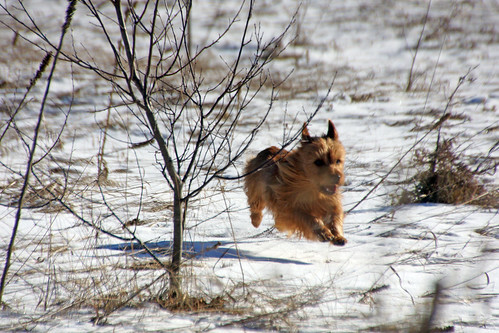 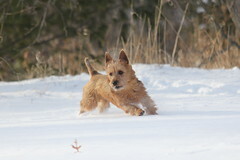 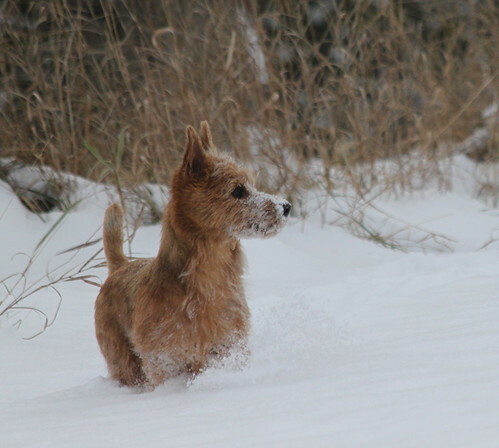 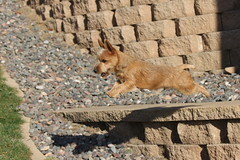 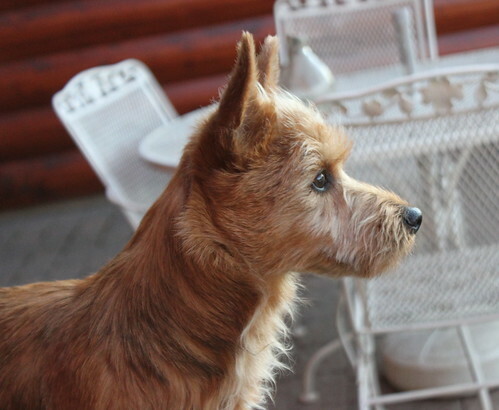 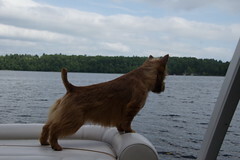 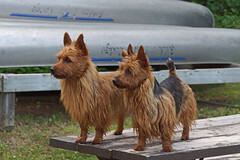 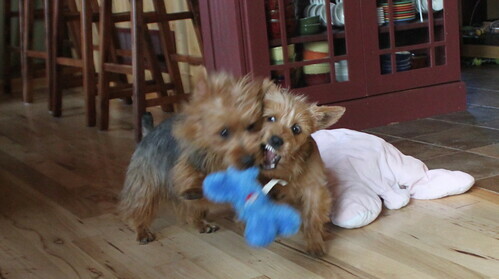 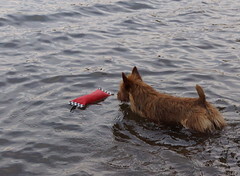 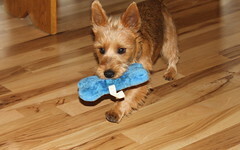 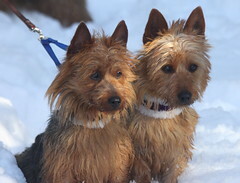 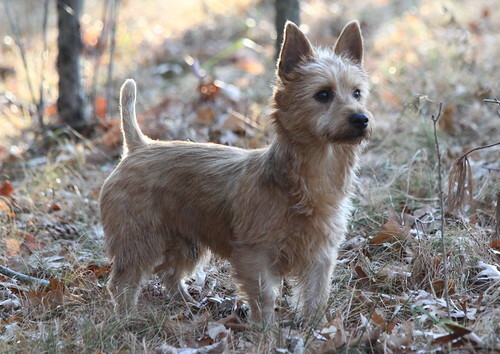 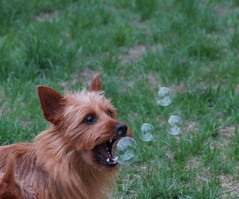 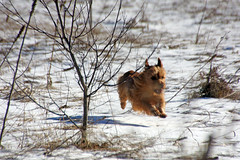 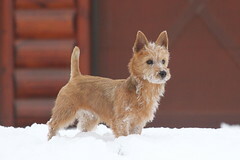 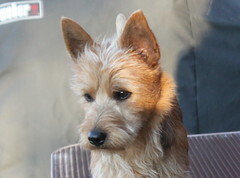 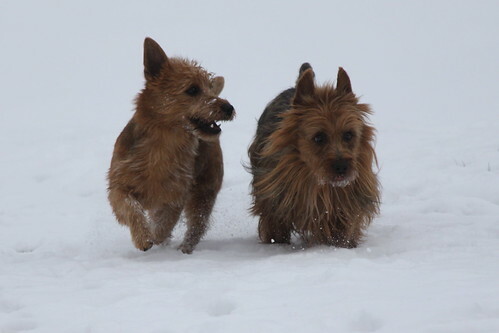 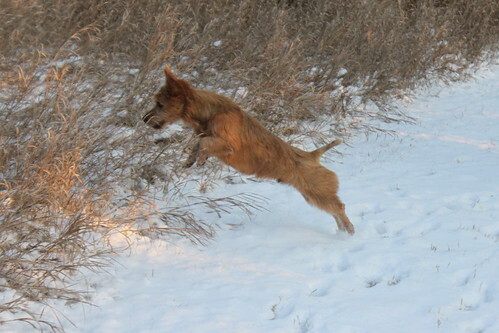 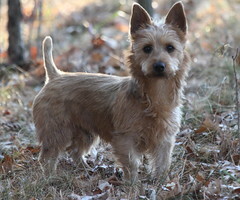 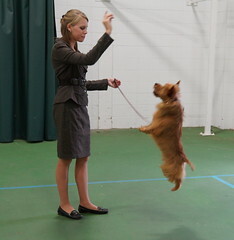 It was a very large and competitive group of Terriers. Group 3 Win for Jake and Ellie in Illinois. 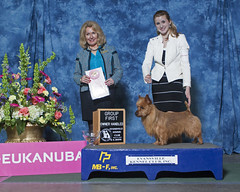 Thank you to Mrs. Dennis (Mary Lou) Kniola for this great honor. Judge Col. Joe Purkhiser for this great honor! 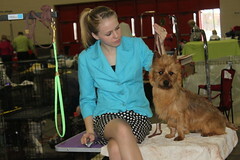 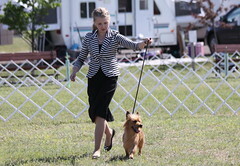 Shown by Breeder, Owner, Handler Lydia Goiffon. 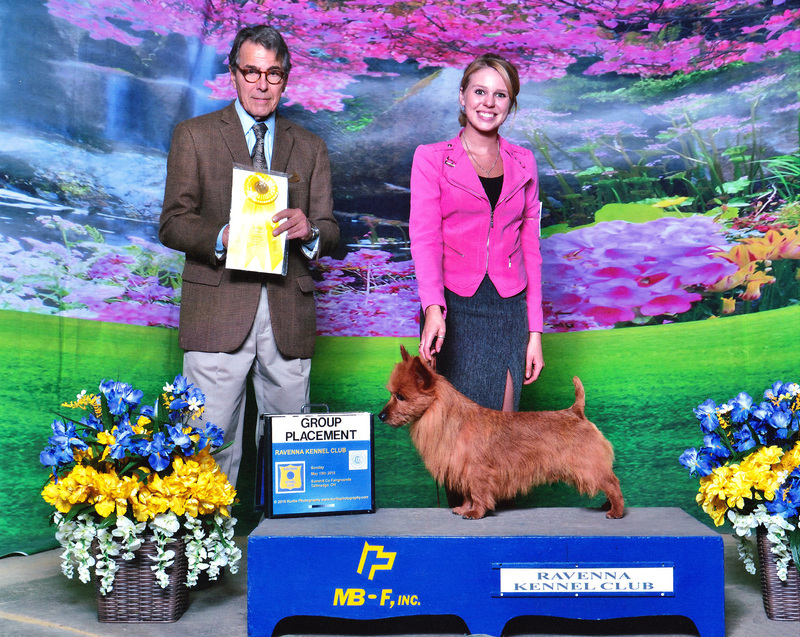 Thank you to Judge Mr. Robert Shreves. 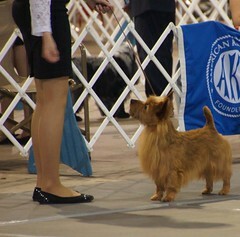 He has already won his first group placement. 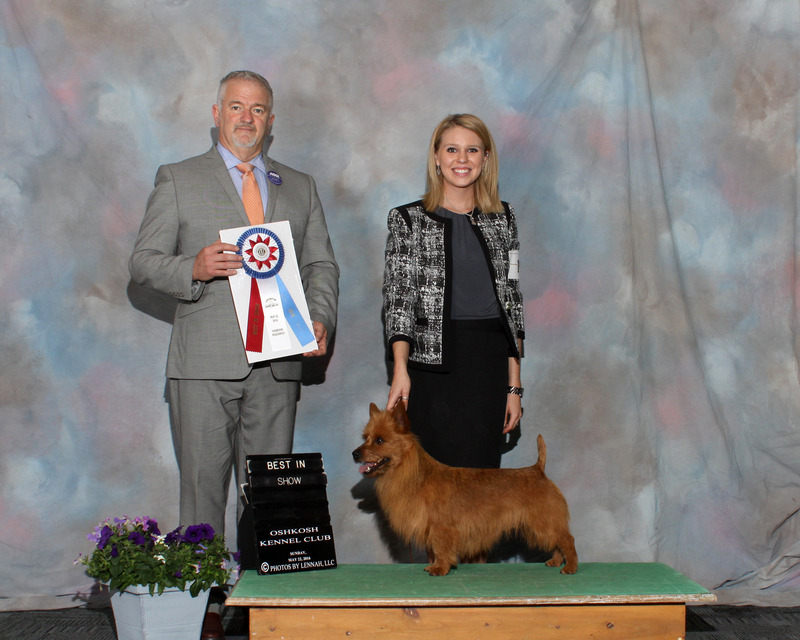 Thank you to Judge Robert Shreve for this honor. 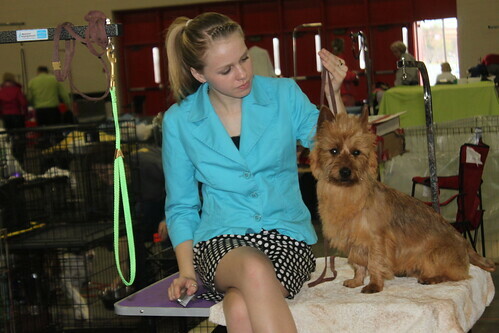 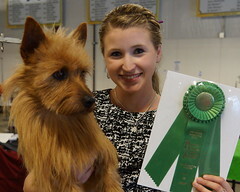 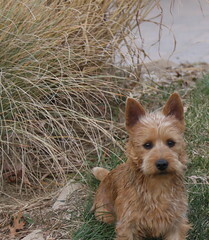 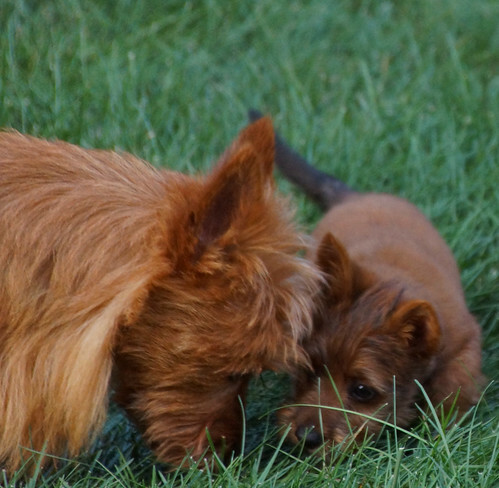 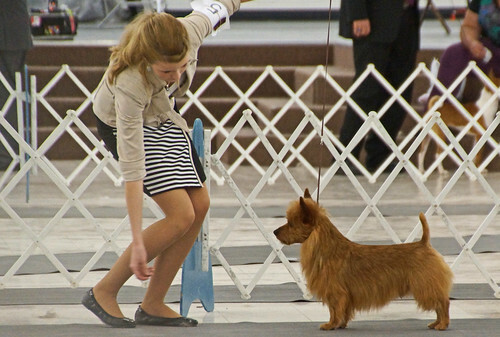 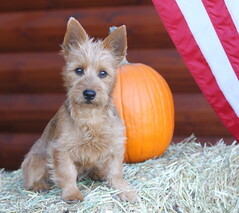 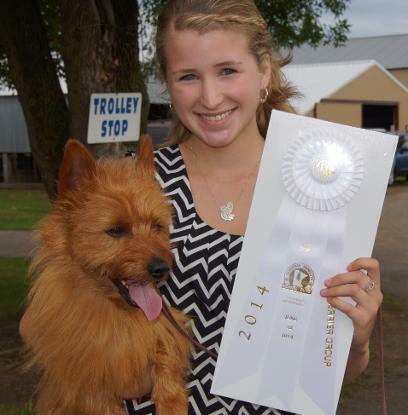 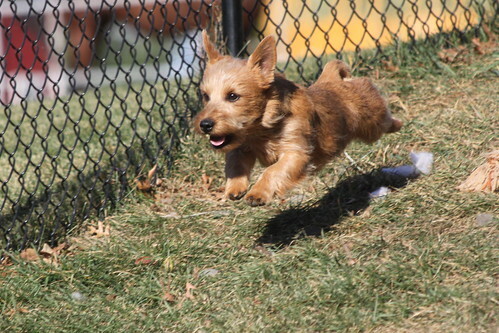 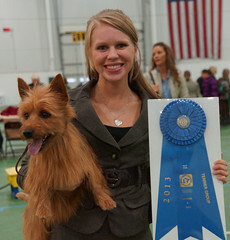 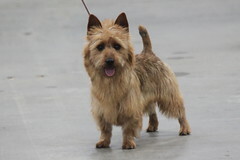 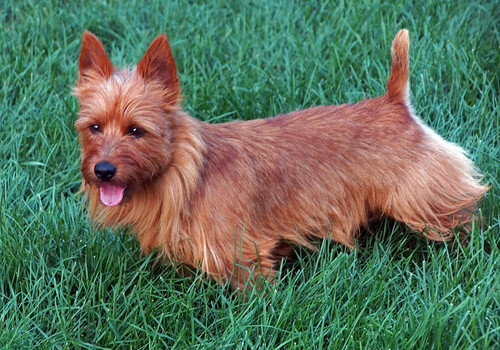 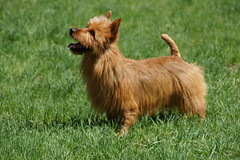 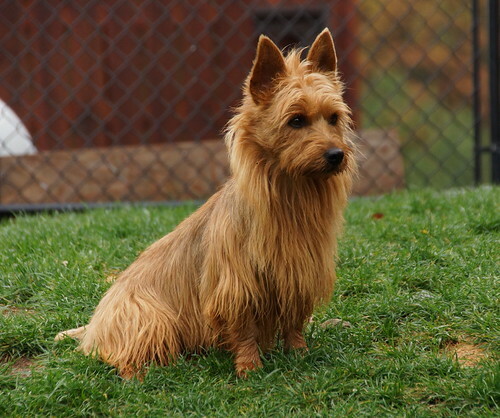 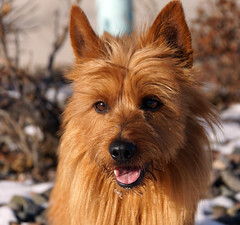 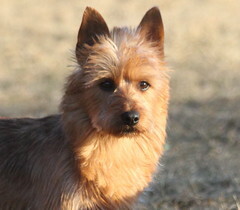 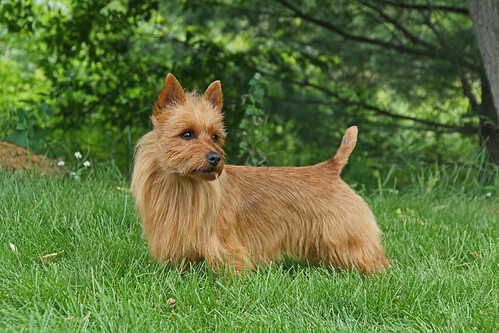 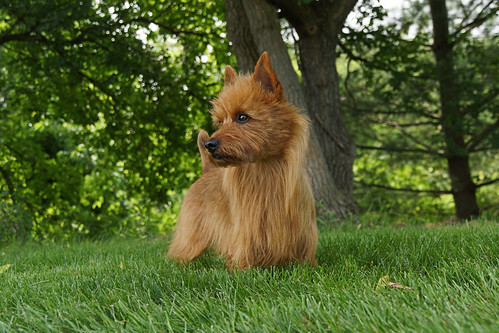 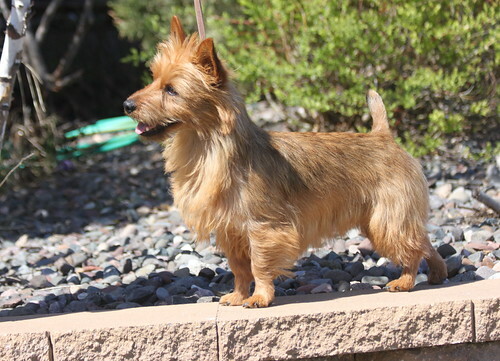 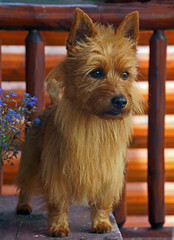 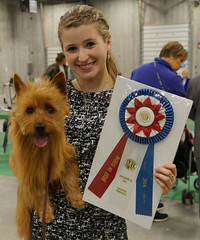 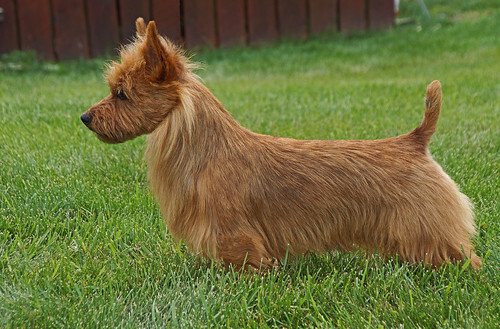 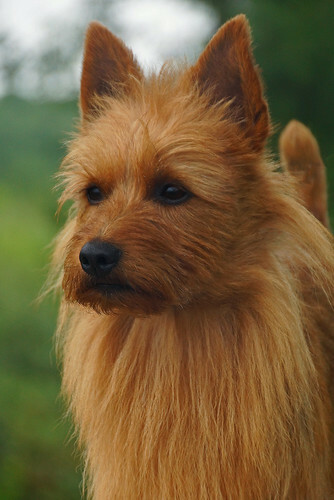 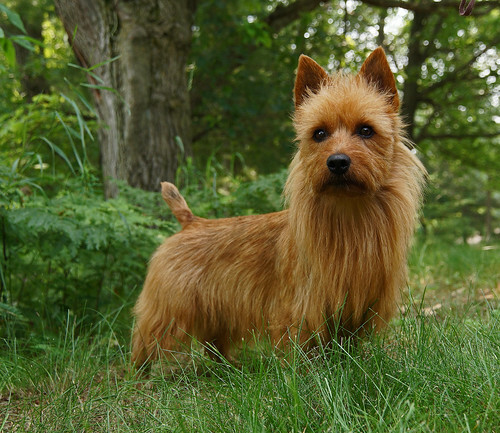 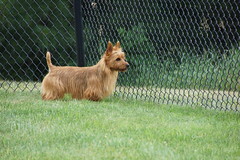 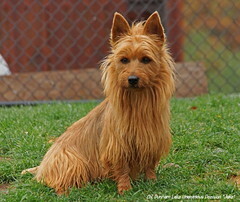 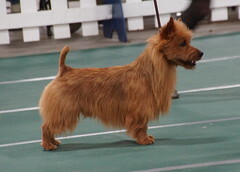 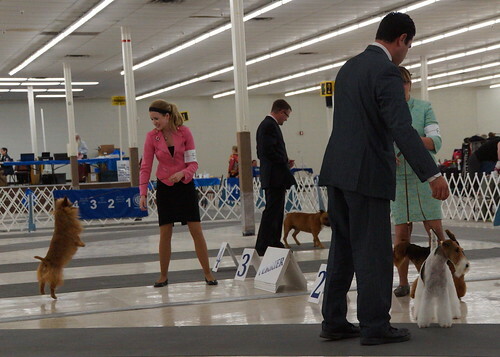 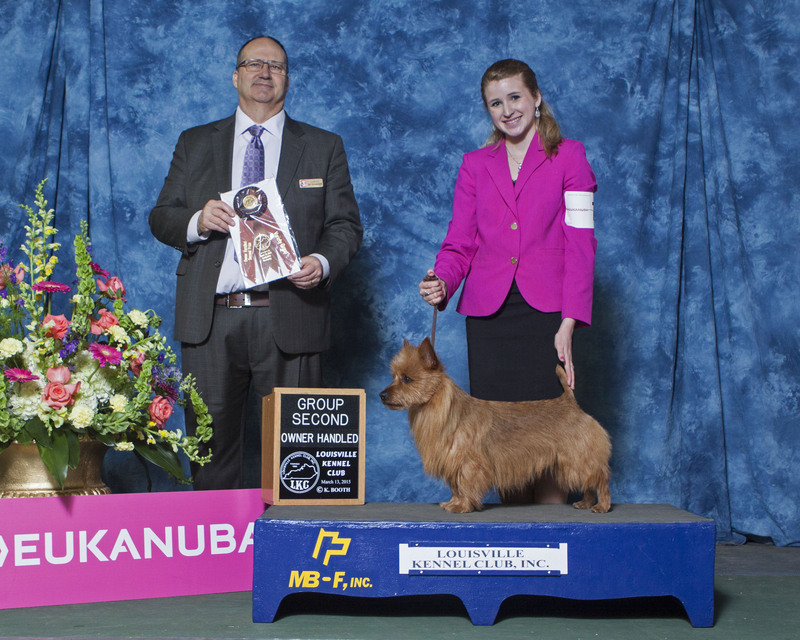 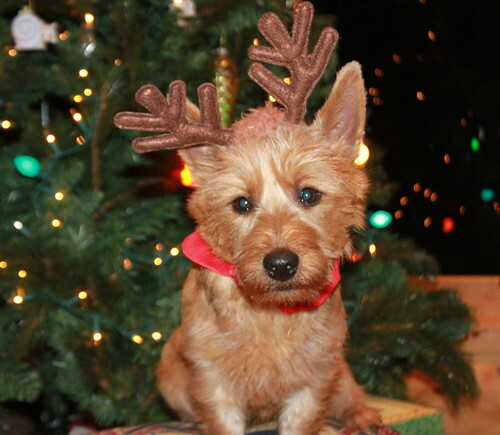 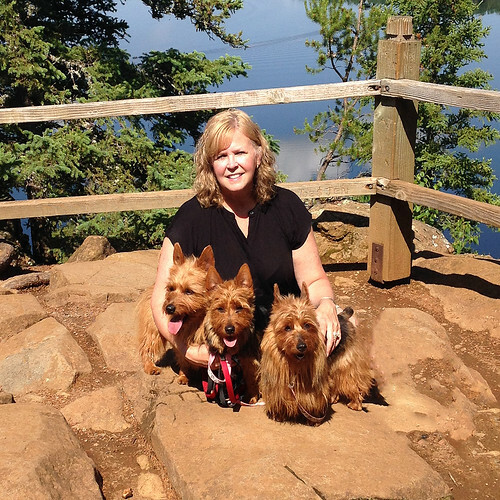 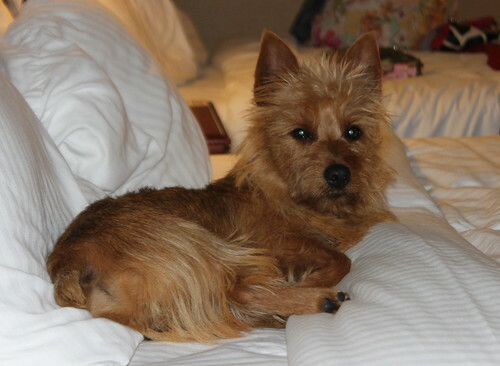 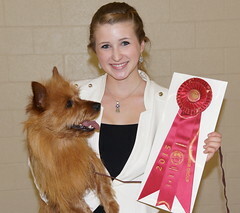 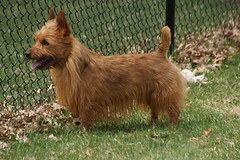 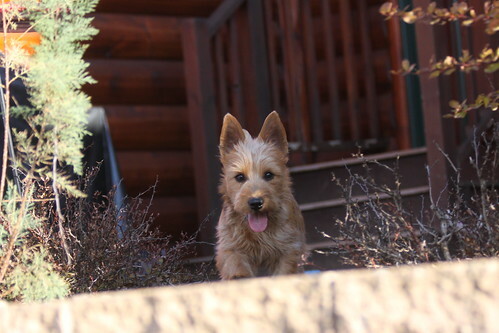 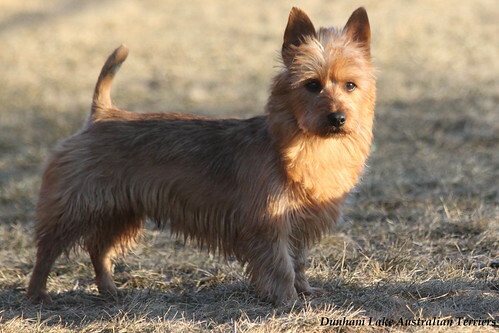 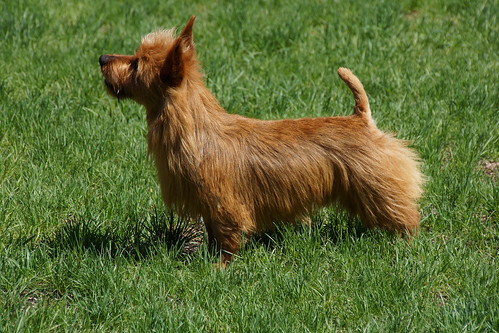 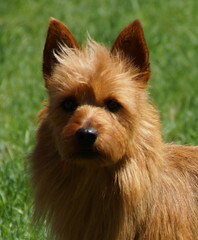 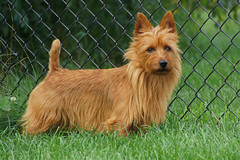 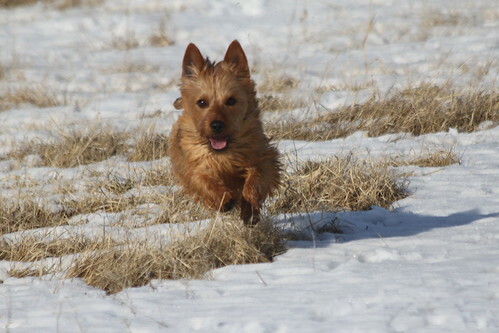 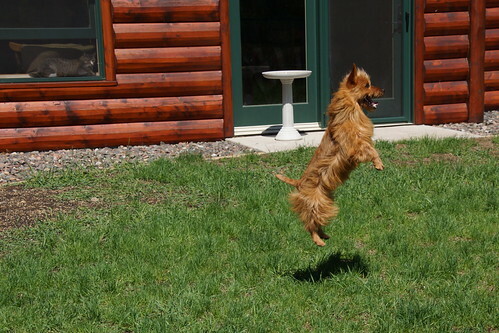 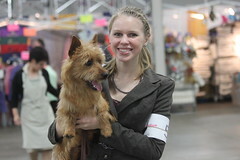 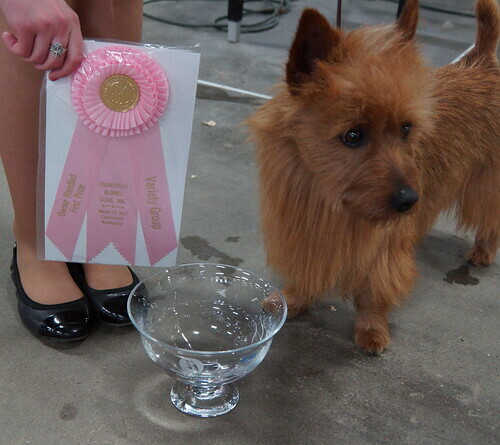 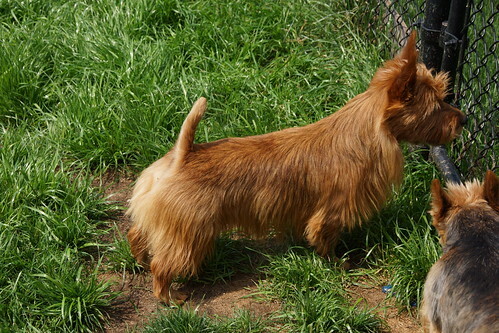 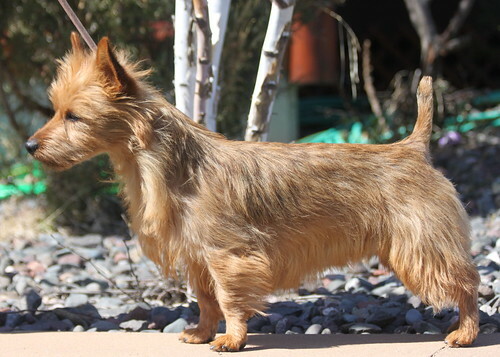 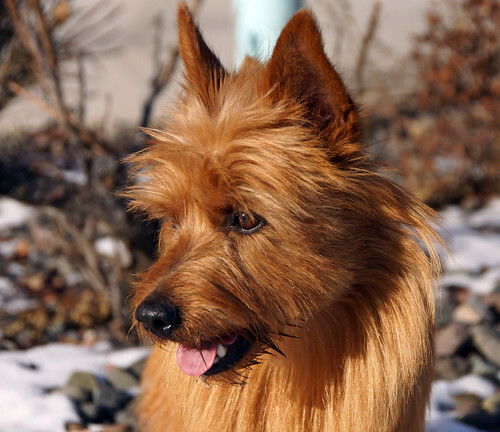 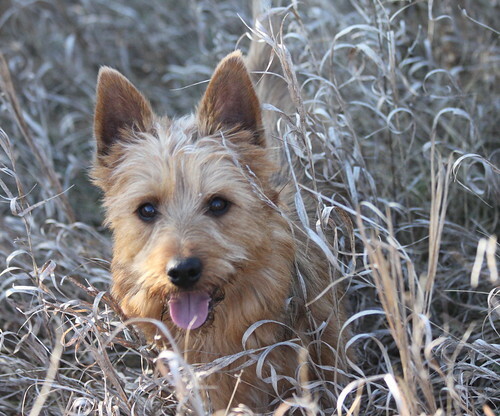 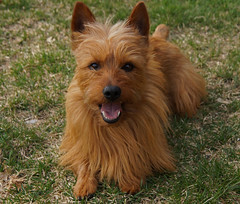 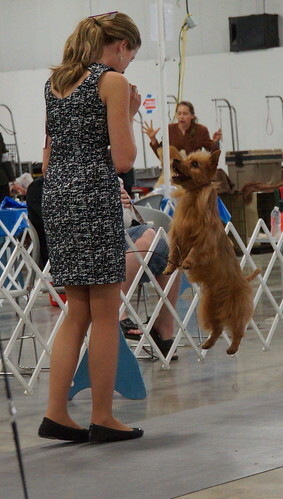 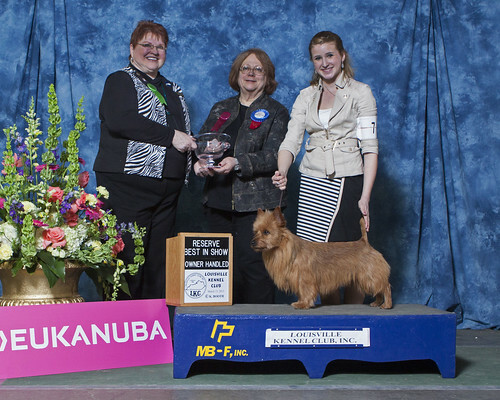 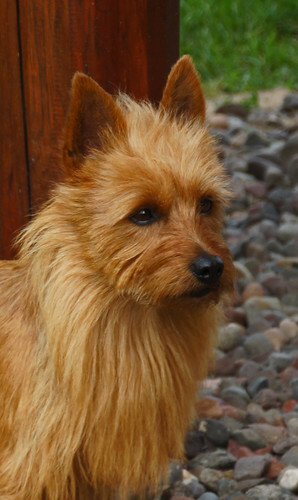 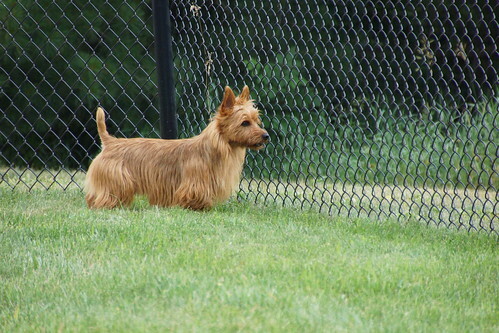 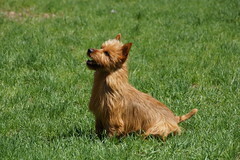 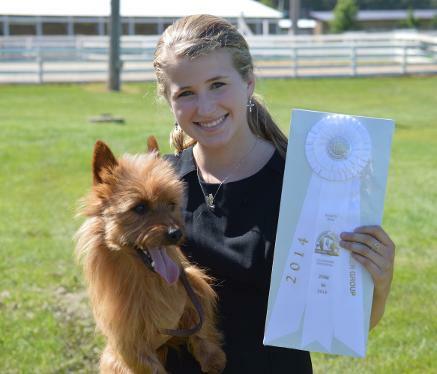 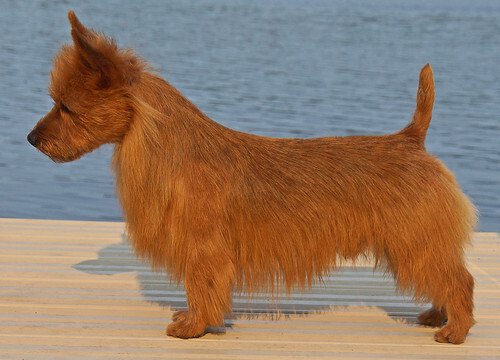 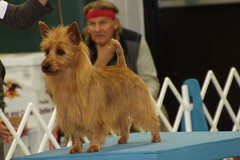 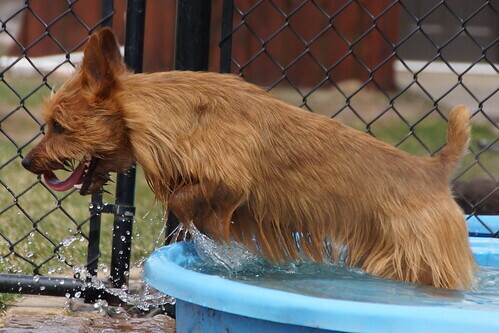 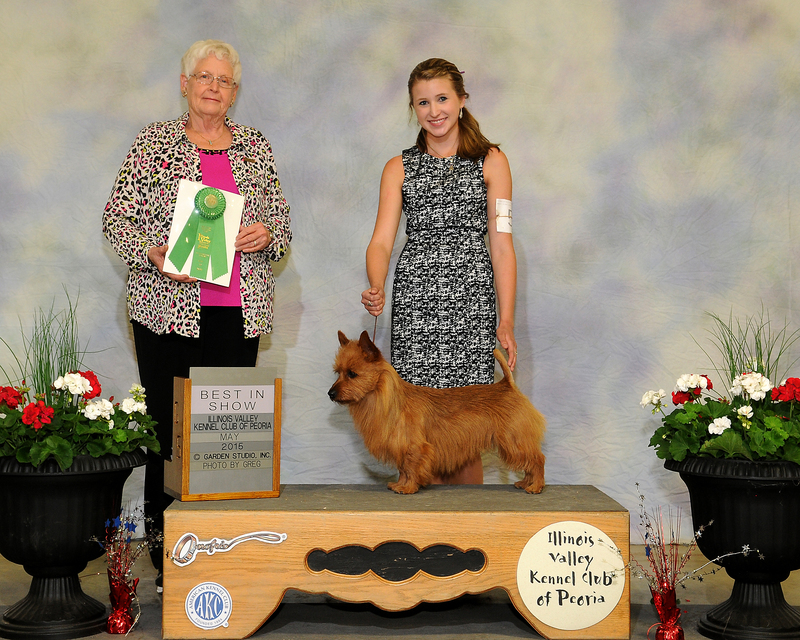 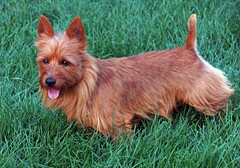 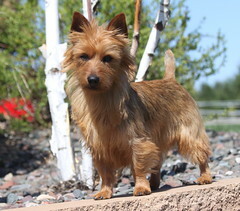 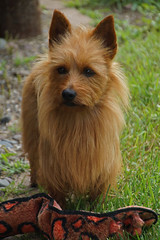 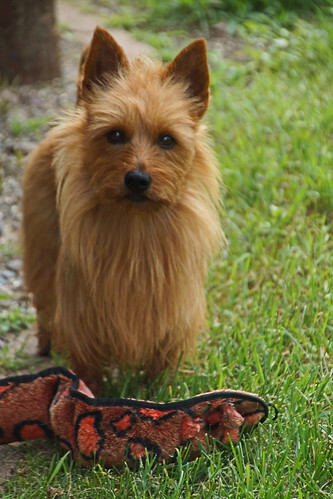 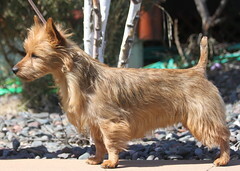 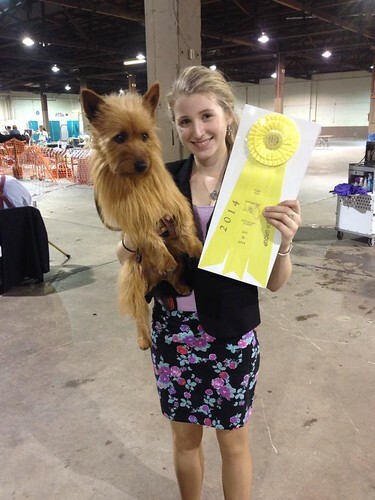 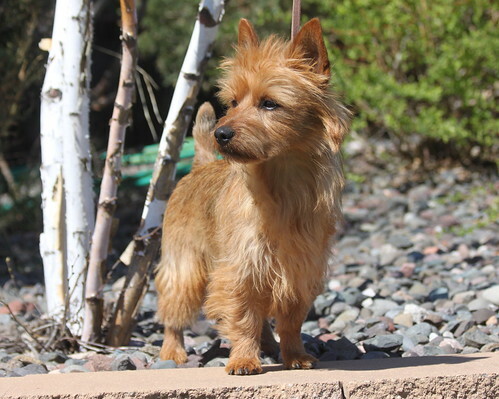 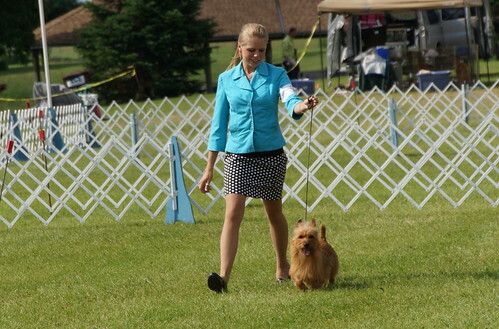 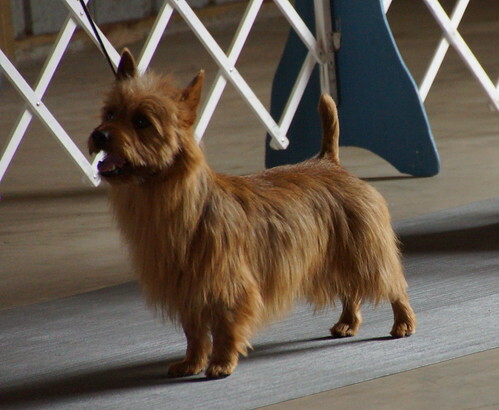 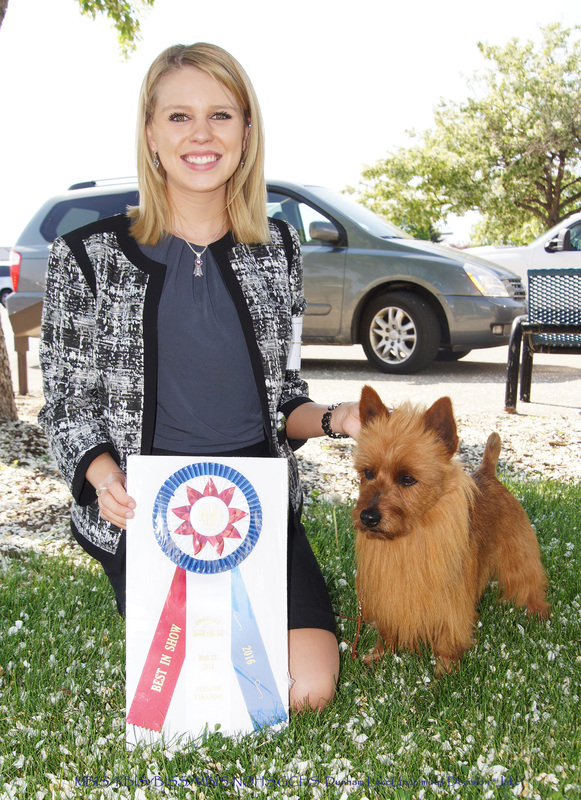 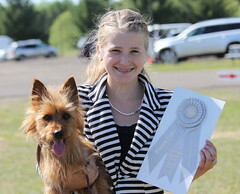 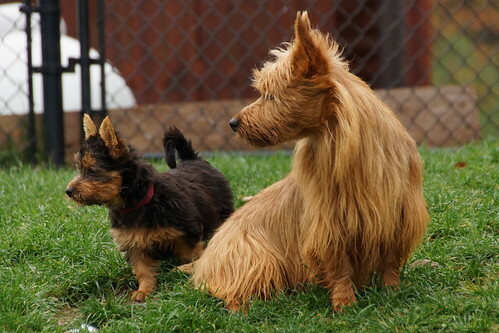 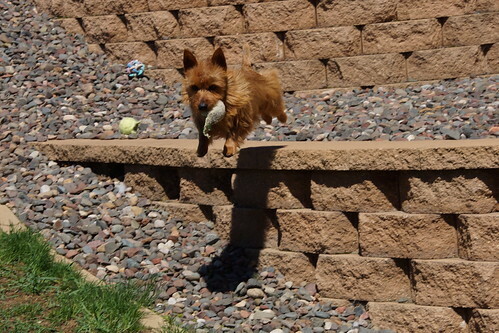 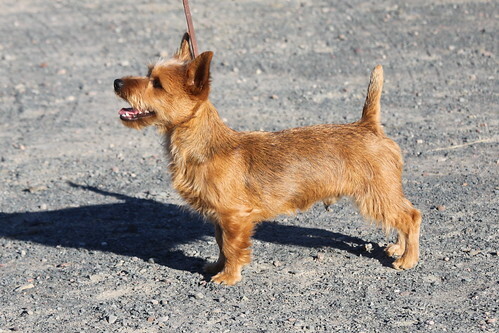 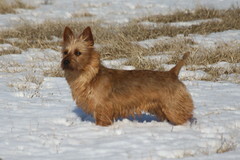 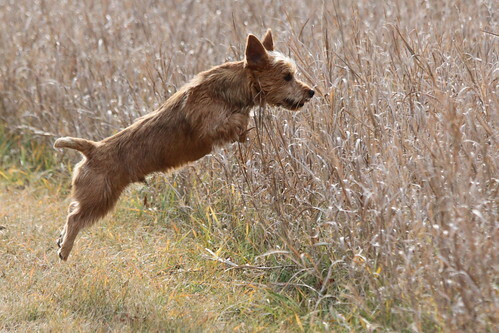 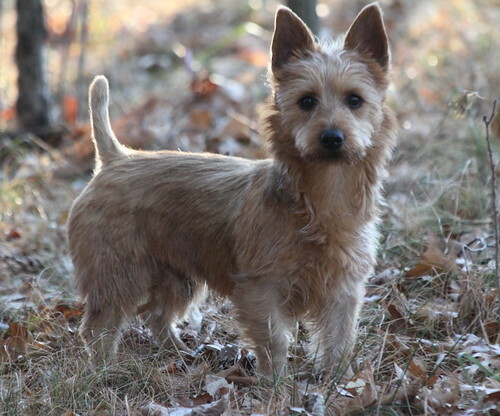 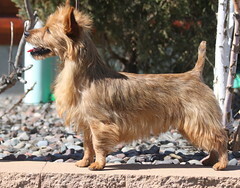 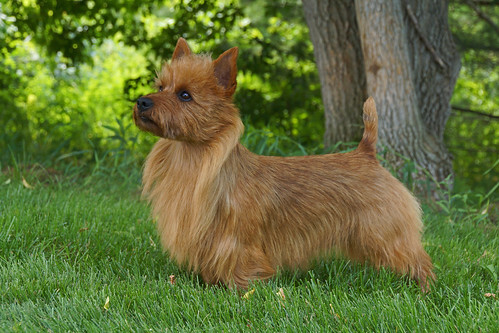 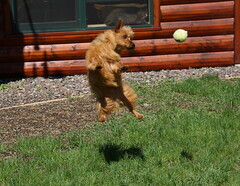 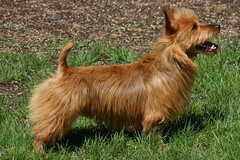 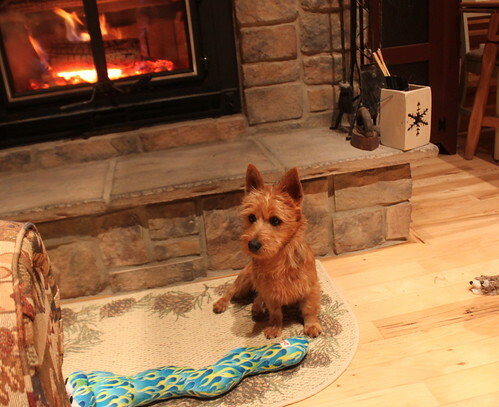 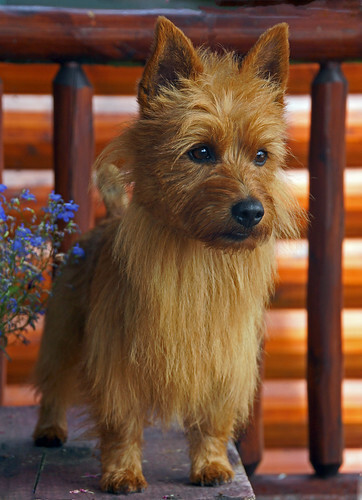 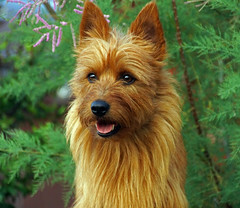 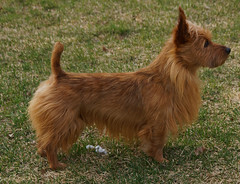 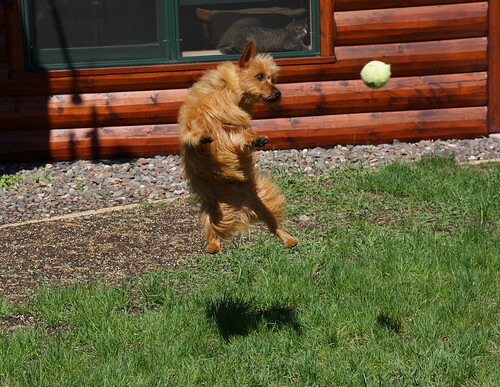 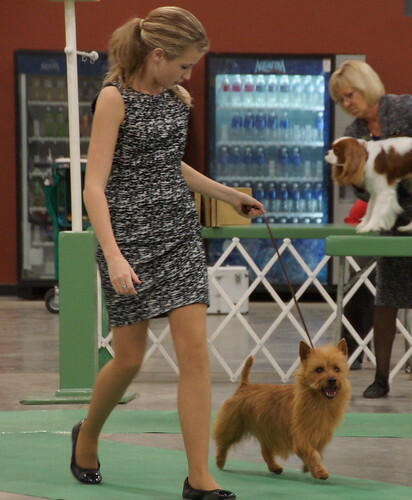 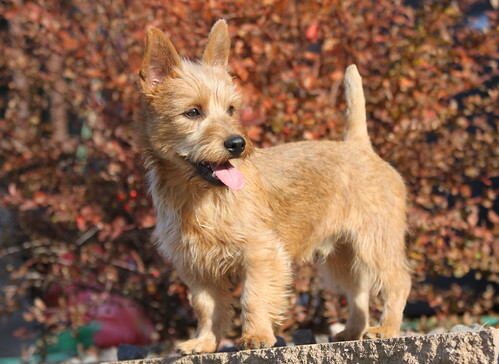 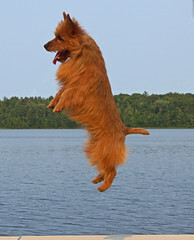 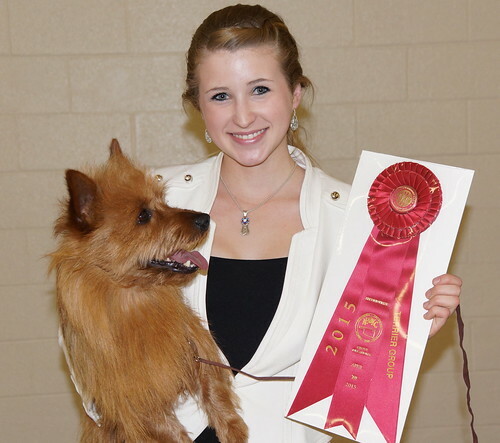 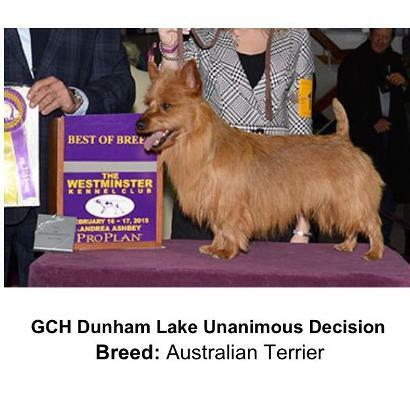 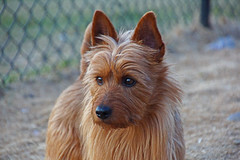 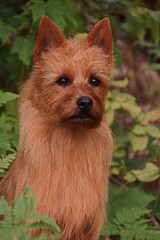 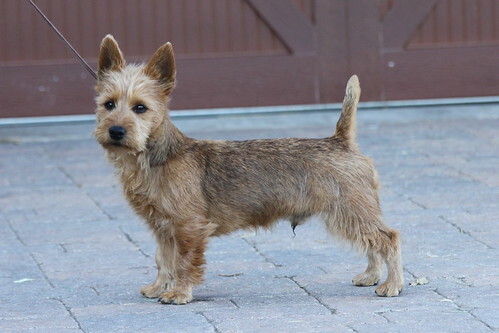 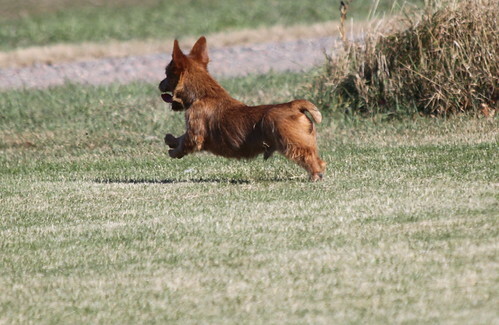 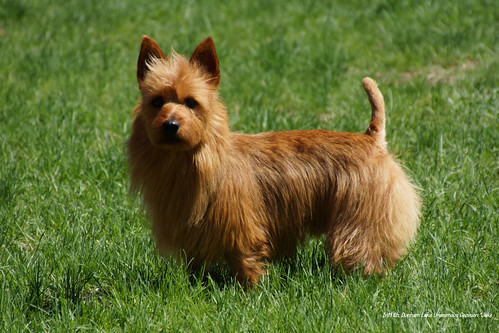 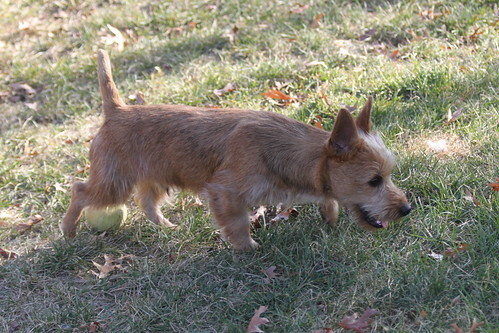 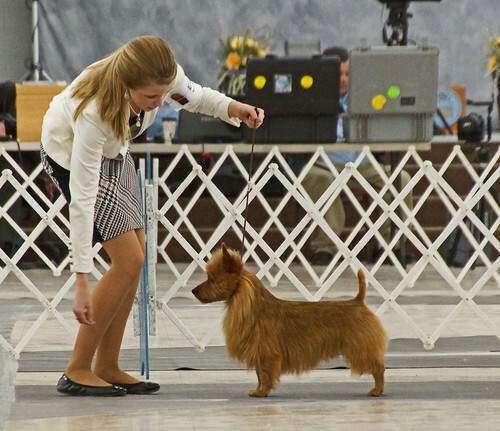 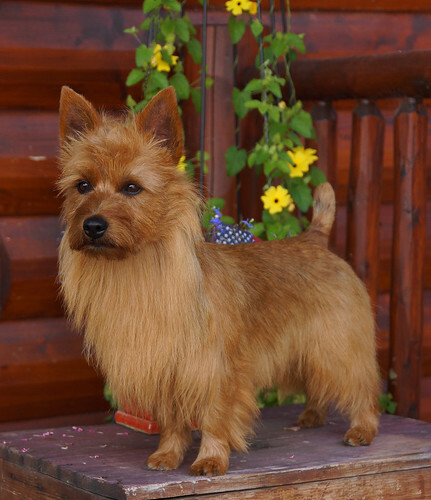 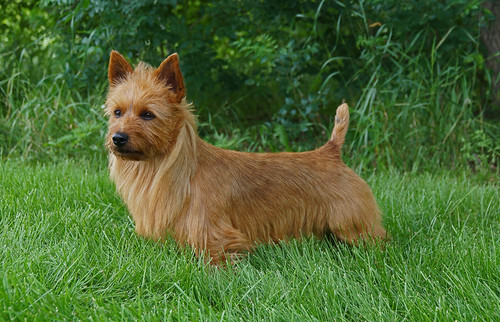 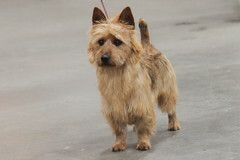 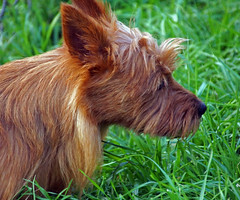 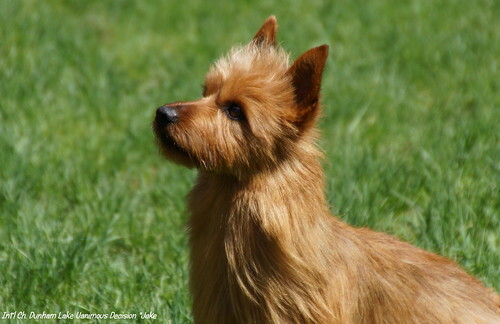 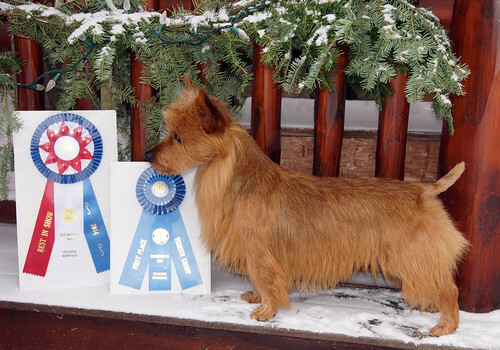 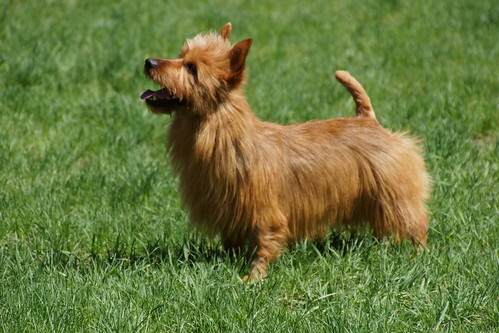 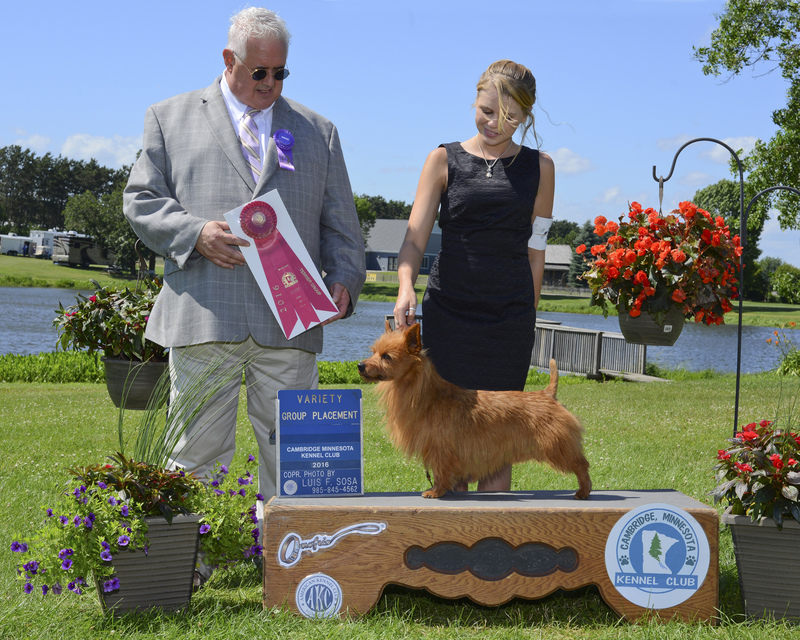 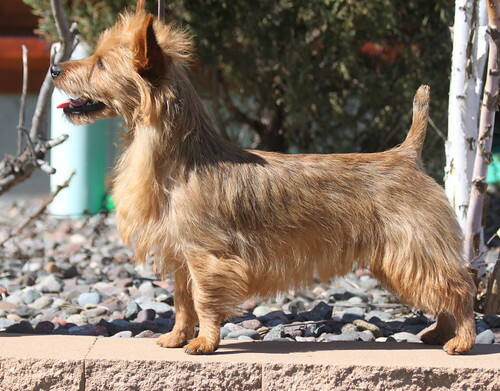 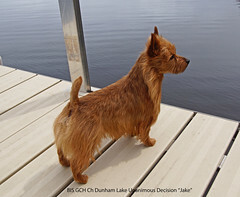 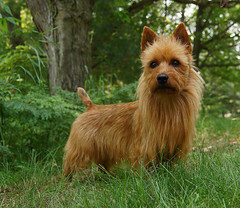 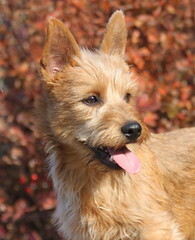 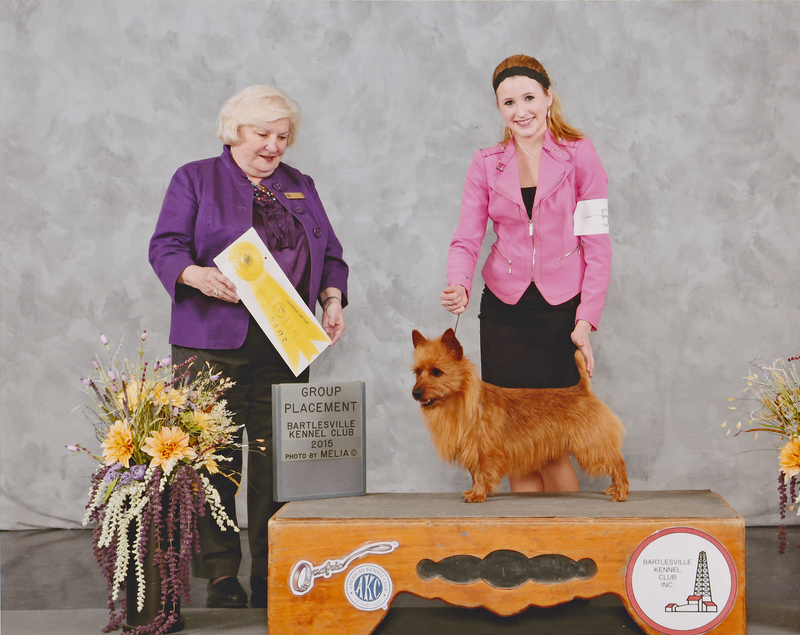 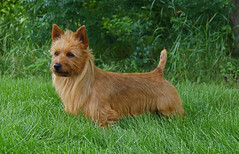 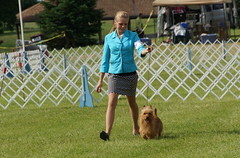 Best of Winners at the 2013 Australian Terrier National Specialty!